The other day Joy recommended Lenovo computers to a friend. “Lenovo,” she questioned, “that’s an obscure one.” Not really. Lenovo bought IBM’s personal computer business some years back and has been getting good reviews ever since. It’s coming out with a “convertible laptop” this quarter. The Lenovo “Thinkpad Helix” is a tablet and PC in one. At first glance, it looks like an ordinary laptop, but the screen lifts off and can be carried away as a separate tablet. Whether this appeals to you depends on how much you’re willing to spend. The $1500 price tag is $500 more than you’d pay for a tablet and laptop separately. But if weight is a consideration, a convertible laptop may be worth the price. For instance, the combined weight of the iPad 3 and a typical laptop is around five pounds. The Lenovo convertible is only 3.7 pounds. On the downside, it comes with Windows 8, which takes some getting used to, to say the least. 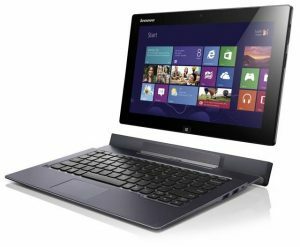 The unpopularity of Windows 8 is confirmed by the fact that in December, only 1.7 percent of those browsing the web were using Windows 8. At a comparable point in the life of Windows 7, new users had already reached 6.8 percent, according to research firm Net Applications.